Editor’s note: Dalibor Rohac is a policy analyst at the Center for Global Liberty and Prosperity at the Cato Institute. You can follow him @daliborrohac. The views expressed are his own. It’s now a decade since Ukraine’s “Orange Revolution” brought hope that the country could be liberated from its post-Soviet legacy and join the ranks of the successful transitional countries of Central and Eastern Europe. 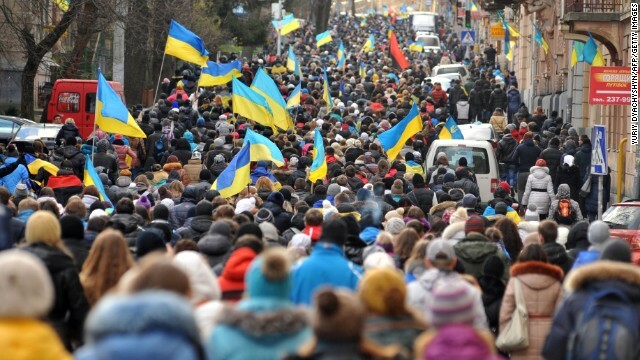 The question now, of course, is whether Ukrainians do better this time around. But to really understand where Ukraine is headed, it’s important to understand the roots of the unrest that led to the ousting of President Viktor Yanukovych. First, the country’s oligarchic elite, which ruled the country for the past two decades, cared little about the prosperity of ordinary Ukrainians. The evidence is not just in the tacky mansions of President Yanukovych and his men, but also in the fact that the average income in Ukraine is roughly one third of that in Poland even though both countries started from around the same point in 1990. Second, the change of government in Ukraine follows a miscalculation on the part of the Kremlin, which long considered Ukraine as its client state, dependent on imports of natural gas from Russia. Ukrainians simply lost patience after their government effectively followed instructions from Moscow and canceled the broadly popular association agreement with the EU. Now that the plan to bully Ukrainians into submission has backfired, Russian President Vladimir Putin is likely to leverage the situation to push claims to parts of Russian-speaking Eastern Ukraine – most prominently Crimea and the port of Sevastopol. Regardless of whether such territorial concessions become a reality, with an interim cabinet in place and a new presidential election scheduled for late May, it is time for Ukraine to reckon with the massive governance failure of the past twenty years. The problems facing Ukraine can’t be solved by clever technocrats. But in purely economic terms, the situation is anyway not hopeless. While Ukraine is facing an immediate liquidity problem, it doesn’t suffer from chronically high debt levels – its debt-to-GDP ratio is barely 40 percent. True, there’s space for essentially technical reforms. For example, the country’s energy sector combines state ownership with heavy subsidies, which are wasteful, unsustainable, and contribute to the country’s dependence on imports of natural gas from Russia. The situation can be remedied if energy markets are deregulated and privatized and if private investors start exploiting domestic natural gas sources. Bankruptcy law needs reform as well. Resolving insolvency cases takes almost three years, according to the World Bank’s Doing Business project, and costs 42 percent of the value of the estate in question – compared to only 9 percent in OECD countries. This, together with high business taxes, unreliable protection of investors, and red tape burdening international trade, contributes to the fact that the country is not a good place for entrepreneurs and businesses, placing it 112th in the world on the Doing Business ranking. But it’s not hard to see that the essence of the Ukrainian problem is institutional. It lies in the fact that for far too long the government at large was effectively run like a money-making enterprise for a narrow group of cronies and oligarchs. The country’s public service and judiciary is beset with corruption. According to Transparency International, in 2013, Ukraine’s score on the Corruption Perception Index placed it in the “’high risk’ [group] together with Cameroon, Iran, Nigeria, the Central African Republic and Papua New Guinea” – and risked “slipping even lower in the next year.” The key task for the new leadership is to make a radical departure from the past practices, emulating the experience of countries like Georgia. In 2007, the Georgian government disbanded the entire police force, known for its corruption, and replaced it with a much leaner structure with strong safeguards against bribery. Entire ministries were closed, and close to 30,000 civil servants were fired. After years of unchecked rent-seeking and corruption at every level of government, it is difficult to imagine that Ukraine would make sustained economic progress without similarly bold steps. The reality is that it’s probably unreasonable to expect the United States to be involved in any leading way in the Ukrainian transition – after all, the future of Ukraine is for Ukrainians to decide – the European Union can help. This is not a question of aid. In fact, any large-scale aid package – or "Marshall Plan" – for Ukraine would be counterproductive, especially given the lack of solid institutions that could prevent mass-scale theft and cronyism. Yet there are much better ways of engaging with Ukraine. Countries like Poland, the CzechRepublic or the Baltics offer valuable lessons for the Ukrainian transition, which can be shared at essentially no cost. More importantly, the prospect of EU membership, within a reasonably close time horizon, can provide an incentive for Ukrainian policymakers to pursue reforms that would be otherwise difficult to achieve politically. In the meantime, there are many benefits of EU membership that don’t have to wait until Ukraine joins the club. And while it may be a tough sell in a Europe marked by heightened hysteria about immigration, free trade with Ukraine and an opening of capital and migratory flows to Ukrainians would be hugely beneficial both for the EU and for Ukraine, bringing tangible economic benefits and opportunities to a country that has been deprived of them for so long. « Previous entryWhat I'm reading: Can Ukraine avoid partition? Can you spot bearishness? How about Bulishness? Which one is this author? I think that "Walking Dead" show is so popular because everyone can relate to it on account of their governments being near immortal brain dead zombies hell-bent on devouring those of us normal humans just trying to survive. Don't forget, if ya wanna take 'em out ya gotta go for the head! The best way that Ukraine can move forward is to neither side with Russia nor the diabolical EU. In other words, Ukraine should go it's own way unlike what this Dalibor Rohac says. The EU is nothing but a trap that the Ukrainians need to be wary of! Ukraine is now at the mercy of Russia. The EU cannot fix all of Ukraine's problems. It will take a long time to reform and develop but between now and the future time Ukraine is broke and no matter how much it wants the EU and and end to corruption it is broke and divided. The EU and NATO will not use military force and if they give financial aid it will only be enough to avoid one crisis before another emerges. So I don't know what Putin thinks but I can only imagine that he would not want a country that is so unstable next door. What he does about it we will see soon I guess? The long term goals of the EU and Ukraine will be probably but on hold and be in the hands of Russia. Just my 2 cents. Indeed, the US and the EU should empower Ukraine's neighbours: Poland, Romania, Slovakia and Hungary to help Kiev to develop. Forget Belarus in the north. But the others could benefit from Ukraine's stability. Of the four neighbours, Ukraine may rely more on Poland. Its foreign minister Radoslaw Sikorsky is married to Washington Post's columnist Anne Applebaum. Ukraine's neighbors, the ones you mentioned are doing well, some even great. Poland was the only country no to go in recession. They are doing well because they joined the EU. They are not rich enough to help Ukraine though. Ukraine and Poland have the closest relationship and Poland has been doing a lot to bring Ukraine closer to Europe. They share a long history. One thing would really outmaneuver Putin in the long run, the establishment of the smartest cleanest system of governance the world has ever seen, right in Ukraine, setting an example like this would eventually create the biggest problem of all for the 40 billion dollar corrupt leader next door.